CREATE YOUR OWN NEW ZEALAND ADVENTURE WITH OUR FLEXIBLE BUS TRAVEL NETWORK. Providing the ultimate hop-on hop-off adventure for 30 years, Kiwi Experience takes you to all the iconic spots and helps you to book the most epic activities and accommodation throughout the country. We help plan your trip to suit your needs while ensuring you see New Zealand’s iconic spots and experience heaps of free stuff along the way. Decide what you want to tick off on your bucket list and how long you want to travel to choose your perfect pass. There are so many ways to do New Zealand right. But only one way to do it like you. To start planning your trip, get in touch with our reservations team who are on hand to support you with mapping out your adventure. If you are travelling over summer (December – March), please confirm your start date at least 2-3 weeks prior to reserve your seat. Contact our Reservations Team by jumping on live chat, sending us an e-mail (travel@kiwiex.co.nz) or giving us a call (+64 9 336 4286) if you need any help. 3. Annnndddddd go. Once you’ve decided on your itinerary, get in touch and tell us what date you want to start your trip. Climb aboard the green bus at your agreed pick-up point and meet your travel squad made up of like-minded folks from across the globe. Check out our scheduled pick-up points and timetables on our free Kiwi Experience mobile app. Brimming with local insight and passion for New Zealand, our driver guides will help you find a warm bed, a cold drink and take you to where you want to go. You’ll have a dorm bed reserved for you at every Kiwi Experience overnight stop on the first night. Across certain locations, you may have the option to treat yourself to an upgraded room. Simply book with your Driver guide day by day. Best price guaranteed, pay-as-you-play activities – we ensure each passenger gets what they want out of their trip. Our driver guide will be able to assist you with booking activities. For as long as you want. Our Hop-On-Hop-Off travel network across New Zealand gives you the freedom to pre-plan your stops or wing it as-you-go and the flexibility to change your plan as often as you like. All we ask is that you keep our team informed of your plans so we can ensure we’re ready for you! Make sure you share your Kiwi Experience with us on Instagram, Facebook & Youtube. Tag your photos #KiwiExperience for your chance to feature. 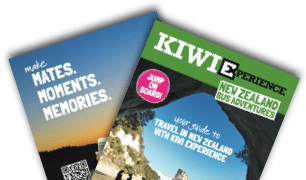 Available from the App Store for iPhone and on Google Play for Android, this app is the ultimate guide to your Kiwi Experience around New Zealand. It's the perfect way to plan your trip and will come in very handy once you are in NZ. Download it now before getting on the bus!